No worries: the seven cards in this article are no joke. Tak Nozwhisker was revealed by Amazing LP. This is the director from China that has made the amazing reveals for Zul'jin and Luna's Pocket Galaxy so I highly suggest watching the reveal video. Desperate Measures was unveiled by Chinese site NGA. Taiwanese site UDN revealed Big Bad Adventurer. Underbelly Fence was revealed by Un33d. The reveal video is in French. Lastly, Aranasi Broodmother was revealed by IGN Brazil. Tak Nozwhisker: I don't know. Seems hard to get some value out of him. 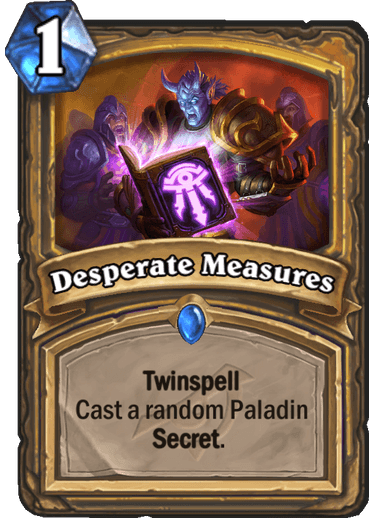 Desperate Measures: Instead of paying 2 mana and 2 cards for 2 (crappy) paladin secrets you pay 2 mana and 1 card for 2 (random crappy) paladin secrets...as I always hate on secrets and secret-interactions I will do the same here: not a good card. 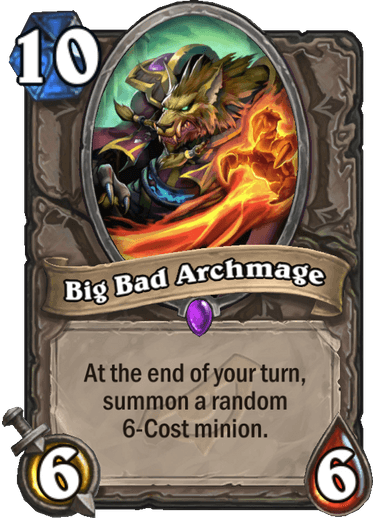 Big Bad Archmage: I don't think that this will see play, but it might be fun to get from a random effect. Also 6-drops are generally pretty good. Underbelly Fence: Cool card! I love steal-rogue and this one is quite powerful in it. Lucentbark: Nr. 1 Target for Hex ...also cool design! 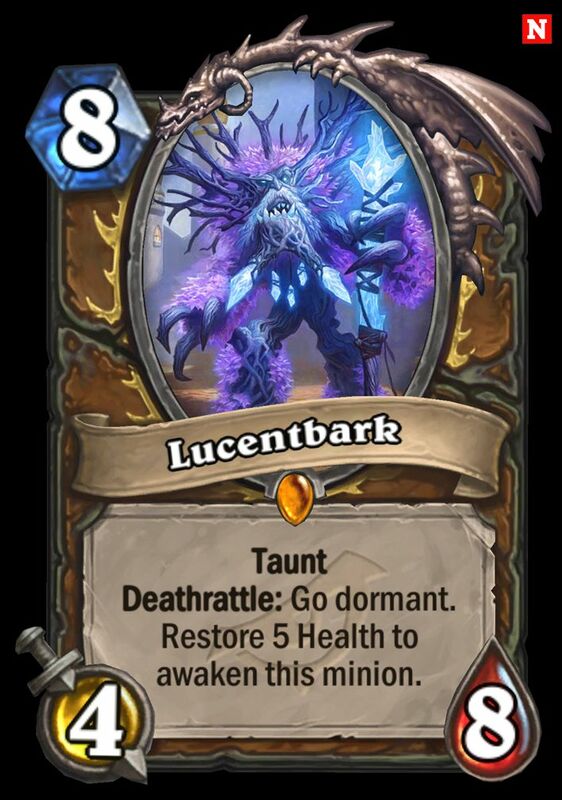 If there will be a Restoraton Druid this might become be part of it. 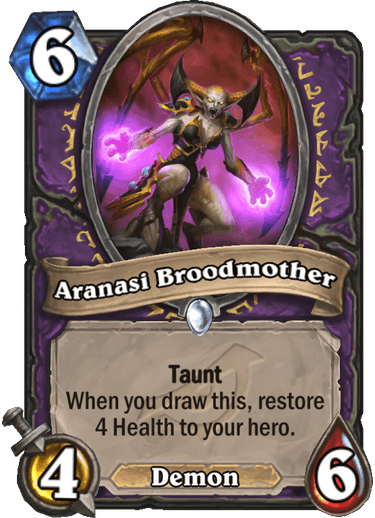 Aranasi Broodmother: Interesting. Combos with the new "Plot Twist". 4/6 are not the best stats for 6 but healing is always more powerful in warlock then in other classes...so...I would keep an eye out for this one. If you play Pilfer 1st turn (Hallucination and Swashburglar in wild also for now) you get the most powerful 2 mana drop in the entire game... Totem Golem was for long what made shaman early game a nightmare to deal with ,well this card has the same stats without overload and can also attack killing EVERY 1 mana drop your opponent played the first turn (Argent Protector is purely outrageously overpowered don't mention it since it puts to shame almost any card made in the past present and future) and almost every 2 drop (aside the 4 hp ones and Doomsayer). It greatly help rogue early game since rogue minions are essentially a joke or they don't exist at all... last one was like Cavern Shinyfinder ages ago. Argent Protector is a fine card, but calling it "outrageously overpowered" is highly exaggerated. If it was, then it would be in every non-odd Paladin deck. It is not. 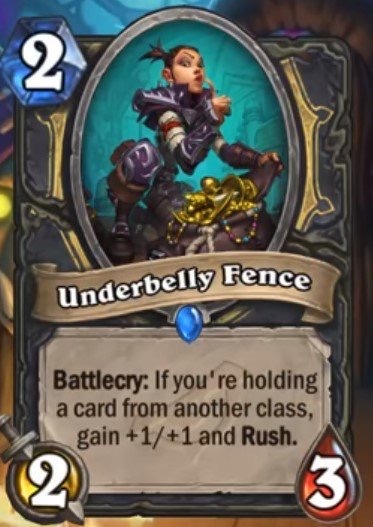 I agree that Underbelly Fence is going to be very good, probably as good to Rogues as Vulgar Homunculus was to Warlocks. Together with Hench-Clan Burglar and Vendetta, it clearly sets a direction for upcoming Rogue decks. In Standard, we are losing Hallucination, but in addition to Pilfer which you already mentioned, we still have Pick Pocket, Blink Fox, Academic Espionage and Stolen Steel. That should be enough to make it roll. Spectral Cutlass isn't going away anytime soon, for better or worse. The video in the article demonstrates the combo with Academic Espionage. You get 10 heavily discounted cards in your hand for just 4 mana. That's a lot of value. Only difficulty is to make Tak stick to the board for one turn, unless you still have The Coin to play both on the same turn. I like Underbelly Fence. Burgle Rogue is an archetype supported by T5 over the years, but now we have some real cards, like this guy, Vendetta, Tess and etc. Seems good. Paladin cards are bad. 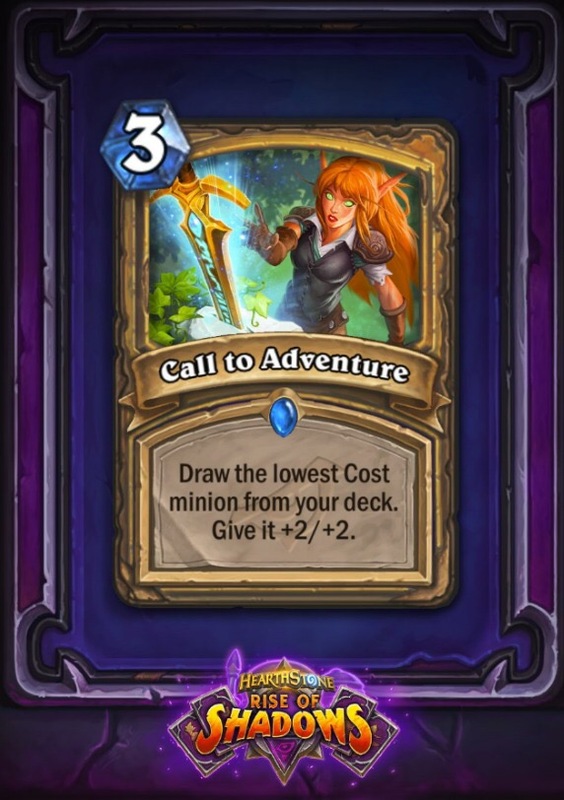 Targeted draw is not a bad thing as we saw from different decks, but what we really want to draw in a paladin deck? Spell paladin with Barnes + Yshaarj in wild. Tak might seem nice with Espionage, but it is just overkill. Espionage+ Tess wins value matchups, also supported by the scheme and maybe Toggwaggle. This is just some greedy as *filtered* win more card. 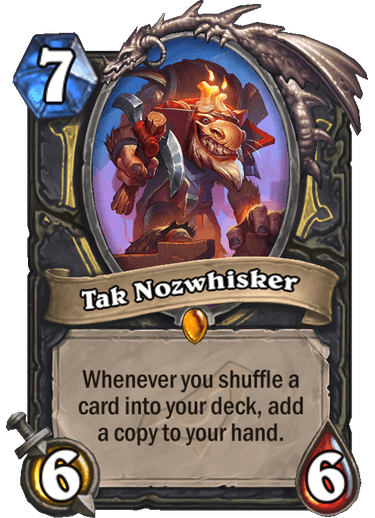 Tak Nozwhisker would also combine nicely with Lab Recruiter. Like, play Lab Recruiter on Tak himself and watch the world explode a few turns later 😉 Or, more seriously. Lab Recuiter on Pogo-Hopper, as usual, except that you no longer need to wait to draw the copies. My bad the correct name is Righteous Protector I've confused the name since I don't play the game in english. Yes as you said the other is just a fine card. Oh, Righteous Protector. Yes, I must agree with you on that one, it's very strong and very popular.